Should we not get the money together before the property sells then all monies donated will benefit Missouri Missing 501(c)(3) general fund. 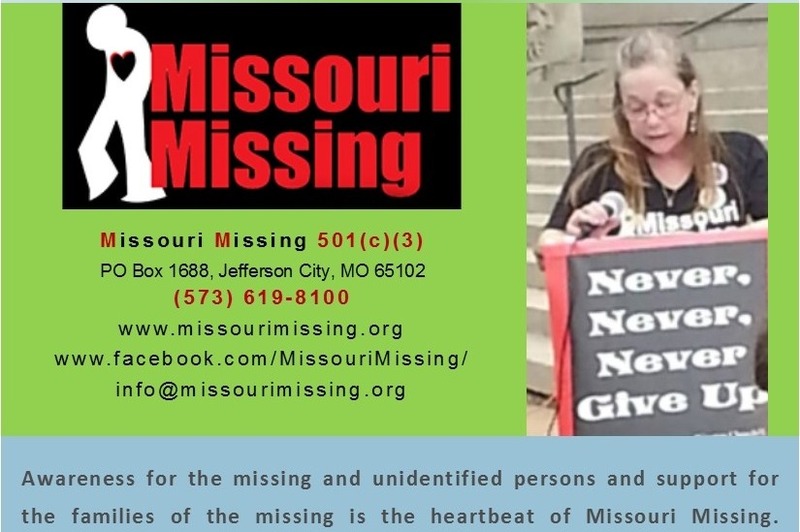 Missouri Missing is a 501(c)(3) nonprofit organization. Our mission is to unite as one voice for our missing; create a support network for the loved ones of all missing persons and to educate and create awareness for the families of all missing persons. If you cannot help, PLEASE SHARE! We have the chance to set things right. Domestic violence ended Angie's life, her husband only spent 4 years in jail for taking his wife's life. Buying the property will turn it from a place of terror into a place of peace. It is our hope Angie's remains will be found on the land. It is our hope that as this becomes a place of peace families of the missing will have a beautiful place to take a break and regroup. Please share with everyone. We need to buy fast before someone else buys it. SHARE, SHARE, SHARE!!!!! !